True to the words of its creator, Azabu Kadowaki presents “a meal to remember.” Breaking old molds of expectations, Chef Toshiya Kadowaki transforms delicacies like white truffles and shark fins into entirely new experiences, where unconventional ideas meet classical techniques. No wonder so many gourmands continue coming back to this beloved establishment, craving to be amazed with every bite. Tucked away on a quiet backstreet in Azabu, you will find a building with traditional kurobei walls made of black painted lumber. As you walk through the picturesque entrance, you will be greeted by a stone statue of a fox, the messenger of Inari, the Shinto god of rice and prosperity. “I learned that the deity that protect this area is the Juban Inari, a bringer of prosperity,” Kadowaki says. His day at the restaurant always begins by bringing some sake and rice to the Inari. 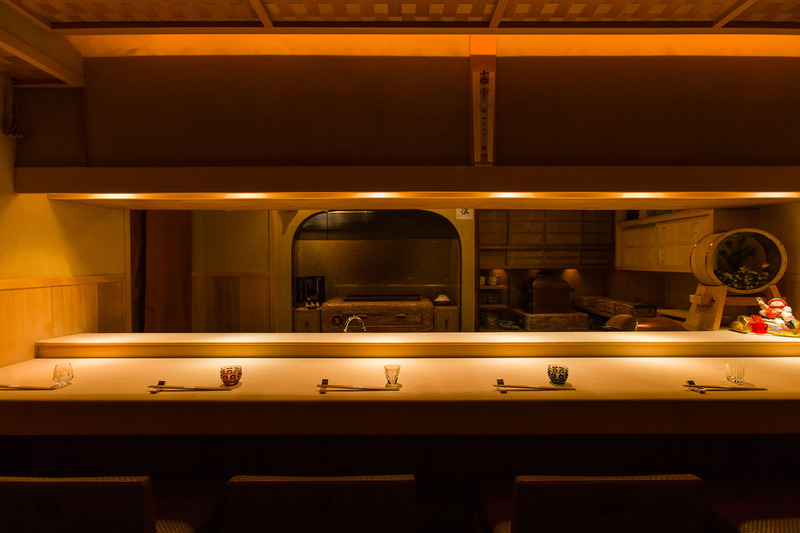 The spacious restaurant is set up with a exquisite hinoki wood counter that sits just six guests. The warmth of the light wood and dim spotlights create an inviting atmosphere. There are also two private rooms, featuring intricate designs such nijiri-guchi, tiny square entrances to a tea room. Set in beautiful traditional ambiance, you immediate find peace of mind. Behind the large counter is an open charcoal grill where you can watch the chef perform his mastery. Next to it are rows of colorful akaraku pottery from bright yellow bowls to deep green plates. You can’t easily come across such a collection of Kyoto tableware in Tokyo. The restaurant relocated to a bigger property in 2006. Despite it being 1.5 times bigger in square footage, he only added four more seats as he wanted to use the extra room for the kitchen. He says he wanted an ideal kitchen to make sure his staff can focus on creating the best food. 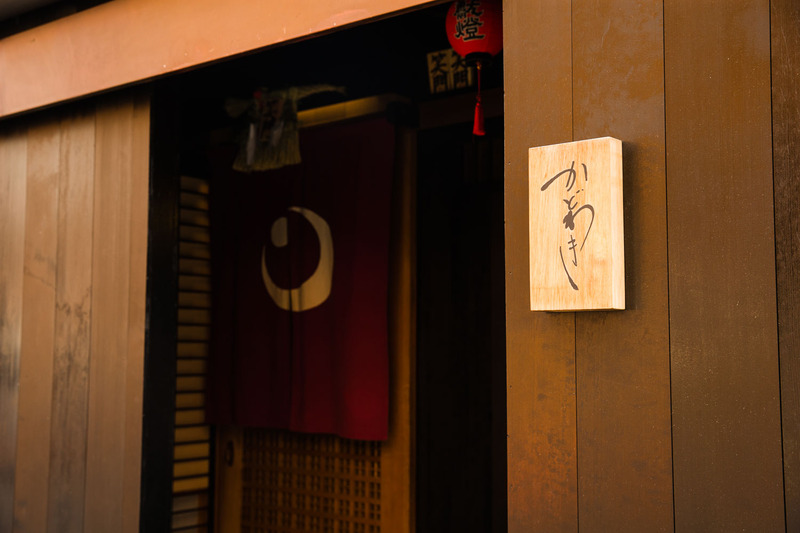 Trained by a veteran, the entire team at Azabu Kadowaki is dedicated to serving the guests. Blessed with great intuition and extensive training, Kadowaki’s culinary talent is top class. He has a gift in coming up with entirely new ways of cooking. Not only delicious, his signature dishes are full of surprises. Despite the restaurant’s established reputation, he remains modest and true to his essence of placing the customers first. This is perhaps the secret behind its long-run success with gourmands coming back again and again. “Being a cook is the greatest job, where you can make people happy in just two hours,” he says. His cooking indeed brings happiness to anyone who tastes it. Again, the philosophy behind Kadowaki’s cooking is “a meal to remember.” Each dish he creates is unique and extraordinary with flavors or styles you can’t find elsewhere. He has this incredible ability to reimagine the potential of each ingredient, his long-time fans say. His only wish is to create a moving moment for every guest through food. “Just like how the first ten minutes of a movie is the most important, the first dish of a meal is crucial,” he says as he prepares the opening of the seven course dinner. 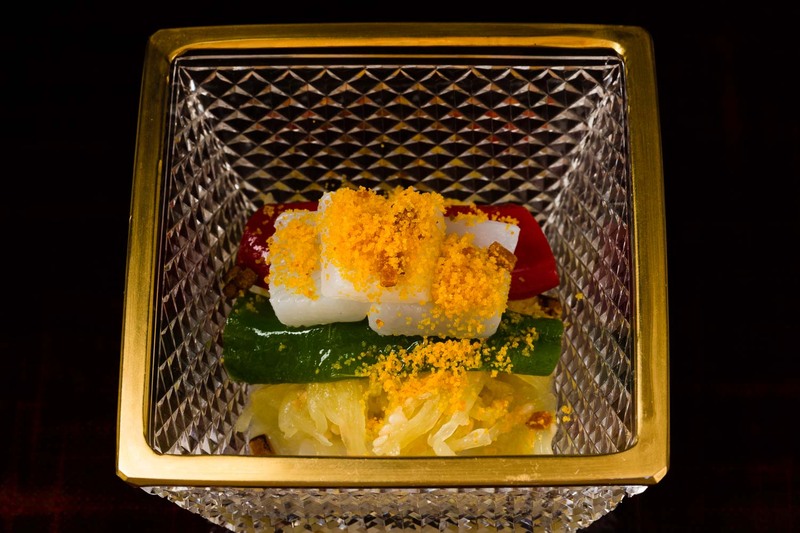 “It sets the tone and expectation for the entire evening.” Served in a beautiful square glass dish with golden rims is a seasonal appetizer of white taro stem, sponge gourd and swordtip squid, dressed in creamy sesame dressing. 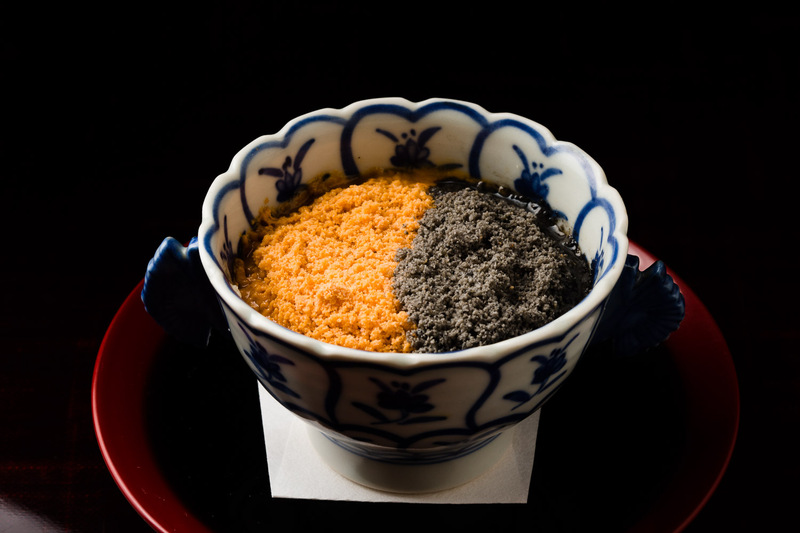 Sprinkled with roasted sesame and homemade karasumi, salting mullet roe, the aroma and texture are simply amazing. Roasted Manganji chili peppers add a nice kick. You may be shocked by the way Kadowaki cooks shark fins. The seafood delicacy typically used in Chinese soups, is transformed into a tempura-like deep fry. 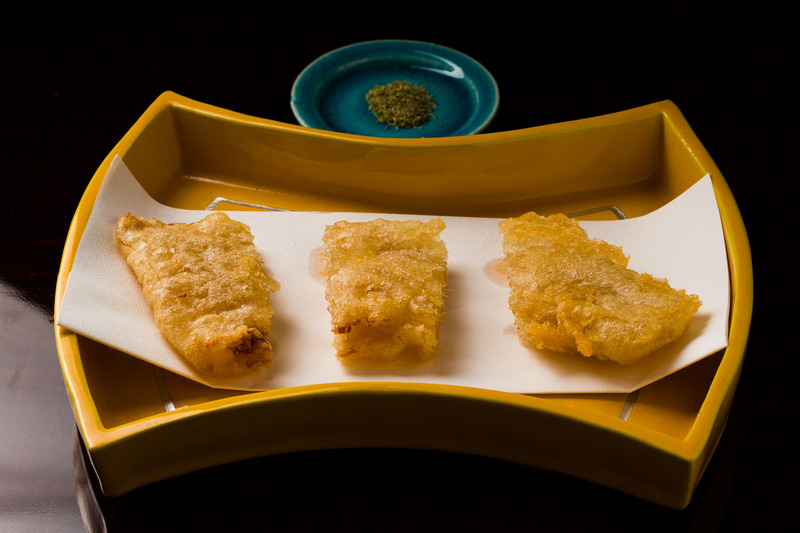 First cooked delicately in Japanese dashi broth for over 6 hours and then fried with egg white batter, the slices are packed with umami and texture. Sprinkle Okinawa seaweed salt spiced up with Sichuan pepper powder for accent. The ultimate must have is the truffle rice. It all began about 16 or 17 years ago when a regular guest asked the chef if he could come up with a new rice dish that was not the typical matsutake mushroom, but just as aromatic. He took on the challenge and spotted a basket of truffles that were sitting on the counter that was to be used for another dish. Just like that, the top signature dish was born. 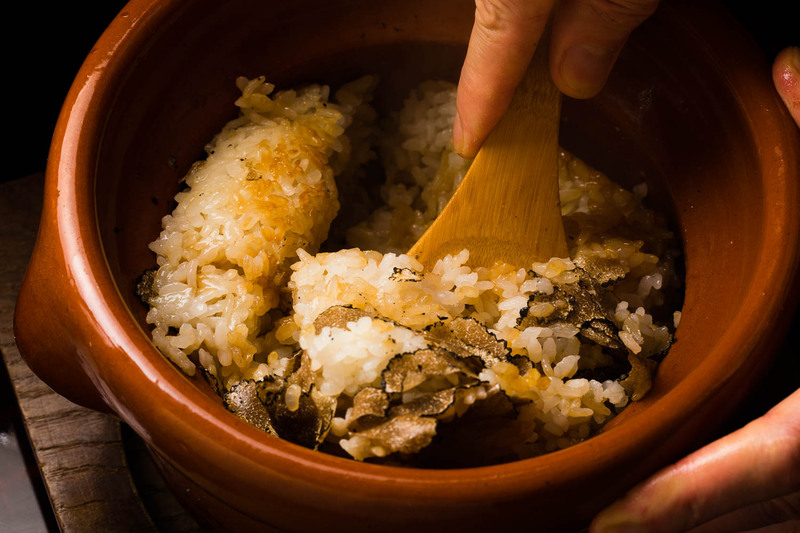 Cooked in an akaraku donabe pot, made by Ippentoh Nakagawa, the koshihikari rice is infused with sake, bonito flake dashi and a heap of sliced truffles. The moment you lift the lid, aromatic vapor fills up the room. Sashimi becomes a whole new experience. 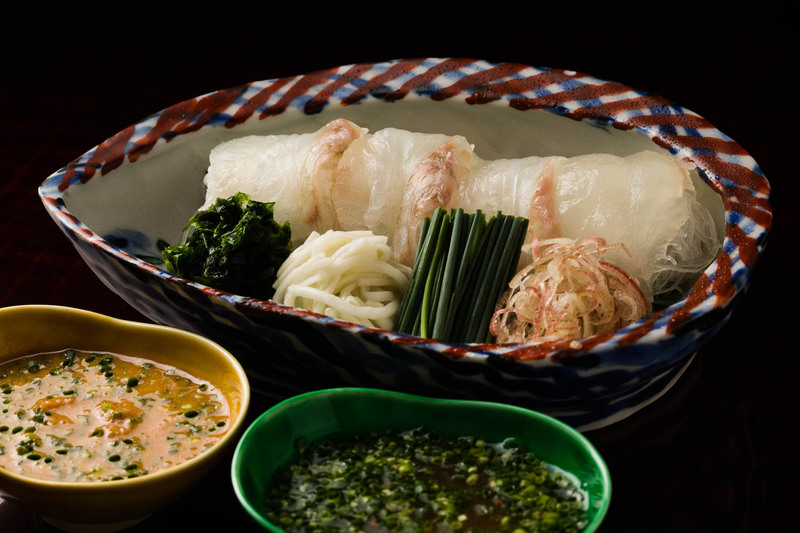 The day’s catch, snapper from Aomori Prefecture, is accompanied with a parade of sauces and condiments, including two vinaigrette sauces, one flavored with salt and the other with fish liver, sliced Myoga ginger, light blue leeks, Chinese yam and fresh green seaweed. 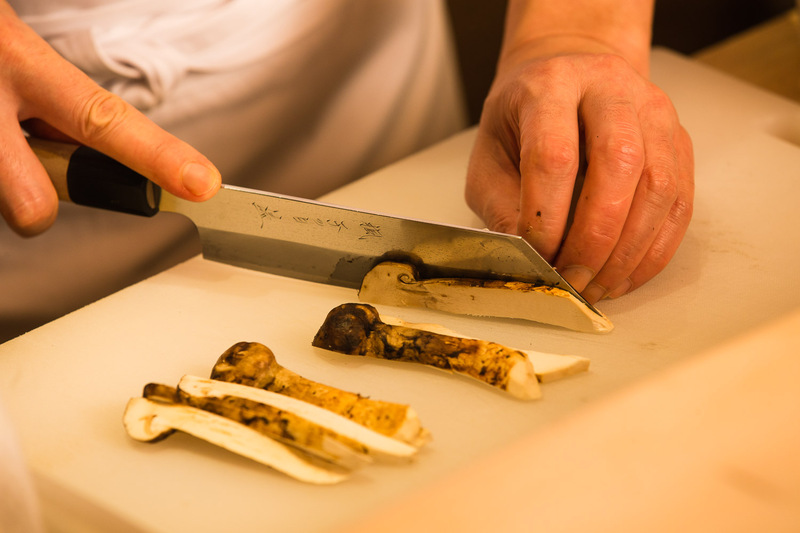 When he has slices of truffles or matsutake mushroom as condiments, he rests the fish for a day for a milder flavor. 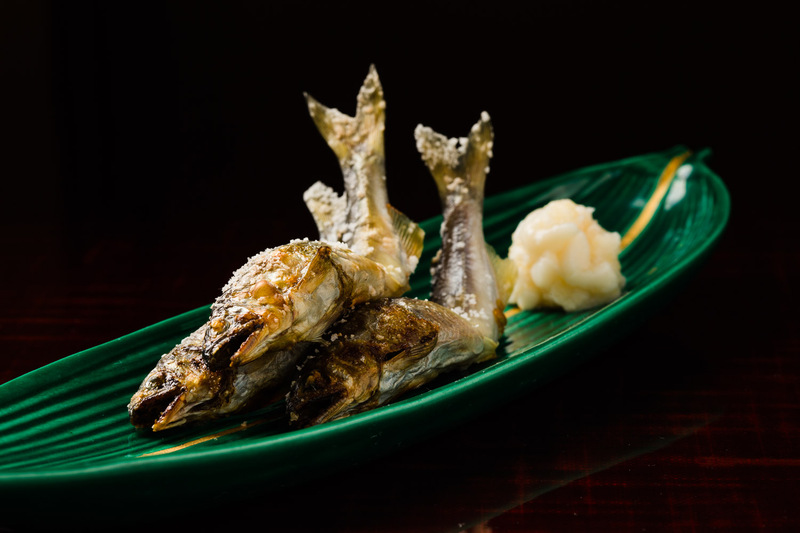 Grilled smelt, a classic summer fish from Biwa Lake, is grilled to perfection and served with white milt. The 7-8cm size is an ideal catch for great sweetness and flavor. Steamed egg custard with crab is smooth and silky. The warm custard is topped with squid ink sorbet and cream shrimp miso, the contrast in flavor and temperature is simply magnificent. About half of the ingredients come from Tsukiji market while the rest from Kyoto. Kadowaki has over four decades of experience working with vendors. He also loves the quality and variety of local Kyoto vegetables. 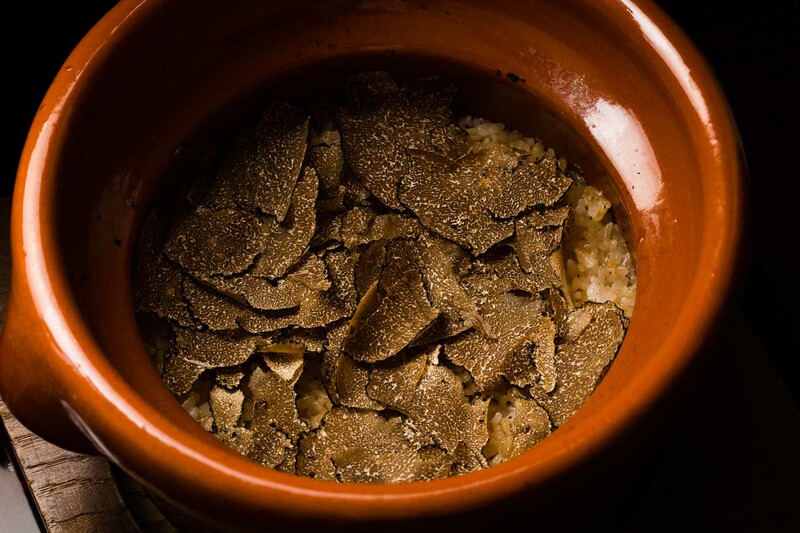 The signature rice dish offers the best assortment of seasonal truffles including summer truffles, white truffles and black truffles. The drinks menu is equally sophisticated with a selected collection of Champagne, wine and sake. The Champagne list along has eight different vintages. The sake picks include major breweries as well as boutique makers. Kadowaki was born in Hokkaido in 1960 as a son of a sushi chef. As his parents wanted to expand the restaurant, they sent him off to an accounting school to study management. Upon graduating, he got a job at a high-class restaurant in Roppongi called Etsu. Licensed with the top rank in bookkeeping, the initial idea was to have him take on the business side, but he began helping out in the kitchen as well. There, he discovered his passion for cooking. His dream to become a top-class chef was fueled further when Rokusaburo Michiba, the owner of the famous Rokusantei and the first Japanese Iron Chef, came by Etsu. Watching him ride up in his bright red Benz and stylish clothes, Young Kadowaki felt a sense of admiration and began working even harder. After training at Etsu for two years, he moved to Tsukiji Uemura to learn from Fukuichiro Motegi. This led him to work as a chef at the Nishinippori shop at age 27. He then made a bold move to join Esquire Club, one of the first high-class membership clubs in Japan at that time, whose owner was the former head chef of Nadaman in the Imperial Hotel. Kadowaki had learned working in the traditional setting Tsukiji Uemura, so he was excited to broaden his perspective training at a new-style restaurant. He later worked at Kamogawa’s Kasumigaseki branch before taking on the head chef role at Kaientei. In 2009, he finally decided to open on his own restaurant at age 40. In the beginning, only a couple of guests would show up every night. But the word on his incredible cuisine spread quickly and his sales tripled in just three months. Some of the guests from back then still continue to visit him today. And thanks to some wine loving customers, he also learned a great deal about wine over the years. On days off, he often gets invited to dine with his closest guests. He said he gains great insights from these dinners as he is able to see things from a customer’s perspective. He then reflects his findings in his cuisine. With no ambition to open new branches, Kadowaki is focused on continuing to improve Azabu Kadowaki. On the contrary he almost wants to narrow down his business to condense his focus and quality. He wants the restaurant to continue being an attraction for its long-time fans as well as young people. He is also committed to teaching the next generation of leading chefs in traditional Japanese cuisine. It has been his greatest joy to go and dine at his former apprentices’ restaurants. He sometimes even makes a surprise visit just to keep them on their toes. “I want to live a life that will allow me to cherish becoming 60,” he says. 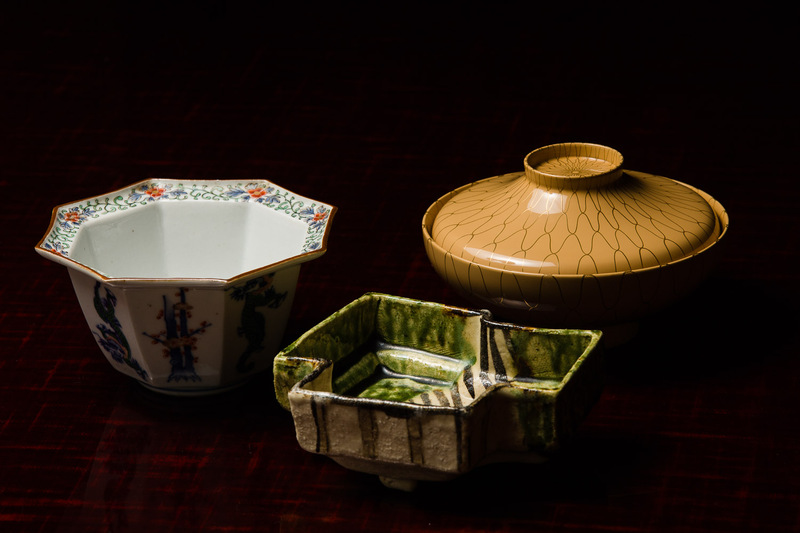 Kadowaki adores the works of Eiraku Zengoro, a Living National Treasure, and uses many of his colorful bowls and dishes at the restaurant. He continues to add to his collection through semi-annual exhibitions at an art club. 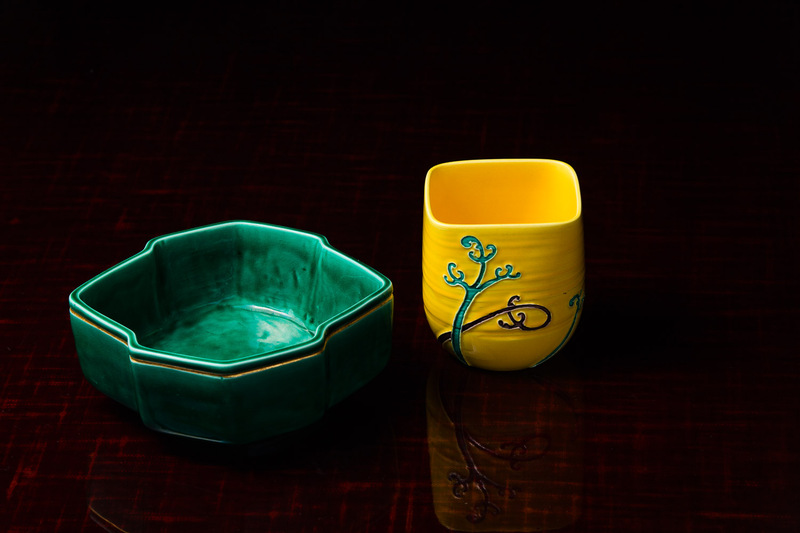 A bowl painted with shiro urushi, or white lacquer, is a beautiful piece for the summer. Its soft and delicate feel is soothing to the eyes. The decorative design on the inside is marvelous too. Just like the menu, the tableware changes every season, each piece carefully picked from a large collection in the storage on the second floor of the restaurant.